NVM Paving & Concrete, Inc.
We get it, parking lots tend to lose their smooth finish after a few years, especially when there are snow storms and ice. Something the DC, Maryland and Virginia area were hit with in the beginning of 2019. But, you’ve now realized your parking lot could be a safety hazard. Or, maybe it’s hurting the look of your property. It’s time to get a quote! Now, it’s time to pick up the phone and shop around for estimates. But let’s face it, who doesn’t like to get the best price? Developing a relationship with a company. Not only does it establish the basics of the price, but it also lays the groundwork for how long the job should take when it begins and other important matters. Getting the best price on sealing your parking lot pavement might cost more than you think (and typically with sealcoating – you’re looking at maybe a few hundred dollars in price variations from company to company). Thing is, parking lots aren’t forever. That’s why you should focus more on building a relationship with your local asphalt contractor vs. hiring the cheapest guy on the block who disappears one year later. Then, when you need something patched up, it’s round two of finding another asphalt paving company all over again. 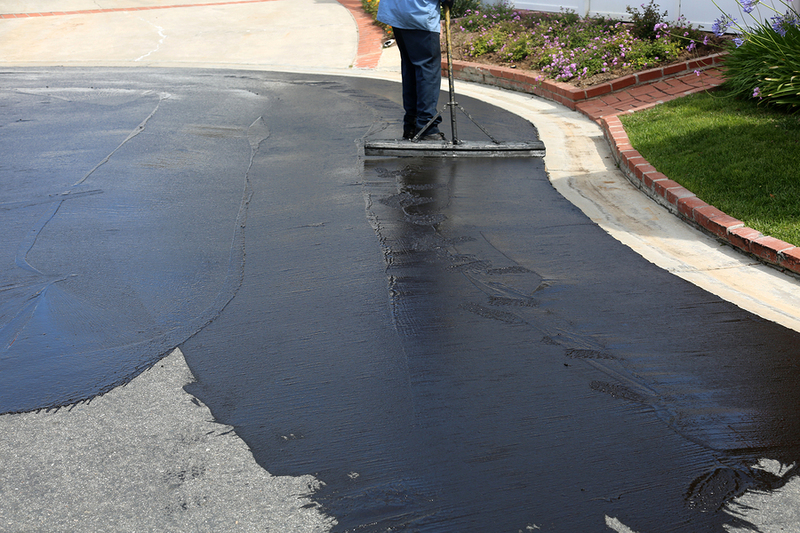 How Do You Find The Best Asphalt Sealcoating Company? Other than getting along with them on the phone after calling, see how detailed they are in providing you with an estimate. How do you know if they provide you with the right estimate? A sealcoating estimate for commercial properties should include several items. A good inspection of a parking lot for a sealcoating estimate should be more than a quick glance from the company. A contractor who knows what they’re doing will walk the area to fully understand what is going to be required on their end to ensure you are taken care of the first time around. Depending on the size and other variables of your parking lot, you may be provided with some options on what needs to be done, right there on-site. Depending on the state of the asphalt surface though, the paving contractor may need to get back to you after the inspection. Once the estimate is sent over, you’ll be informed on the extent of repairs necessary, before the sealcoat is applied. Finally, you should receive a timeline for the work to be started and completed. And most importantly, when the surface will be usable again. Not everyone will be interested in every detail of a parking lot sealing job. We may get excited about it, but we won’t hold it against you if you look at us like we’re speaking another language. Let’s note now a few things should always be covered, or at least offered. When can the property be used again? Are there any dangers to customers in the sealcoating process? Depending on the size of your parking lot, everyone likely has different concerns. Therefore; it’s important to ask all the questions you may have before the work begins. It’s hard to judge if a price is fair without understanding the benefits of a job. Sealcoating provides protection from UV rays, oxidation, water damage, oil and other harmful chemicals. It also increases the longevity of the surface while improving curb appeal. To upgrade a commercial property call NVM Paving & Concrete at 301-288-1753 or end an email to NVM Paving & Concrete . You can also request a free estimate online.